Delaware Arts Info: Get Ready! Hot Breakfast! has a Full-Length Album! Get Ready! Hot Breakfast! has a Full-Length Album! 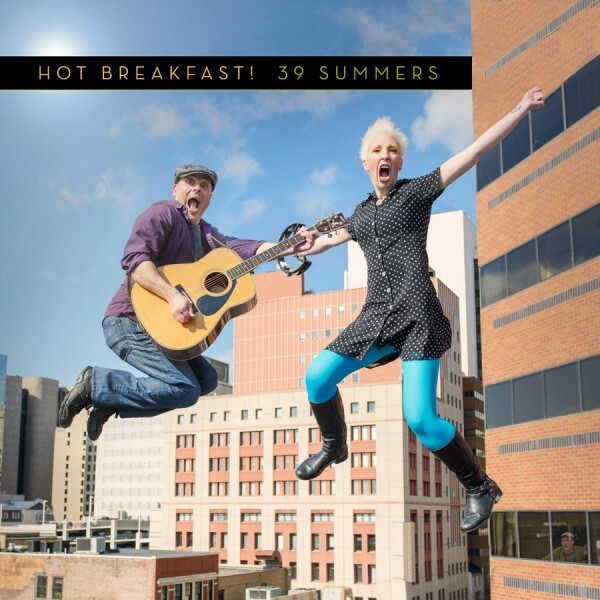 With two Homey Awards for their self-produced, self-titled EP (one for the EP itself and one for lead singer Jill Knapp), the first full-length album from Hot Breakfast!, 39 Summers, is highly anticipated, and has a lot of expectations to meet. The album, which officially drops on Saturday May 18 with a release party concert at World Cafe Live at the Queen (featuring special guests The Honey Badgers and The Joe Trainor Trio), continues their "Acoustic Dork-Rock Power Duo" tradition, with help from producer Ritchie Rubini and engineer Ray Gagliardino. The result is clean, tight, and catchy, with a superfun mix of song types. If you're tempted to write Hot Breakfast! off as a novelty act (not that there's anything wrong with that), don't. Knapp, who also plays percussion, and Guitarist/vocalist Matt Casarino are skilled musicians and songwriters who excel at playful upbeat songs (think "oh-oh"-laden '60s bubblegum -- the real stuff that gave birth to melodic punk rock) and stripped down acoustic story ballads. The silly songs are there, but there's a layer of cleverness and complexity that raises them above sheer novelty. 39 Summers kicks off with the title track, with a frothy pop sound that contradicts (and enhances) its beaten-down lyrics, and right away you know this isn't simple goofball rock 'n roll. There's the acoustic-folk-meets-hard rock "Defender," the self-deprecating retro-rock "I Am Not Cool," the clever "Hole in Your Pants," which sounds a bit like a Renaissance Faire folk song, but is about, well, a literal hole in your pants. There's even some electronica in "Maybe You Saw it Too." The dozen songs weave together flawlessly, with a balance of styles and sounds, Knapp's clear, versatile vocals taking center stage throughout. You can pick up a copy of 39 Summers at the release party (get your tickets online at http://queentickets.worldcafelive.com or call (302) 994-1400). For more information on buying the album, check out hot-breakfast.com.